Having a vehicle shipped is an in-depth process and some research beforehand is necessary. Below we’ll cover a few of our most asked about topics. There are several factors which can effect how long it takes to ship a car. Things such as weather, traffic and any number of unforeseen occurrences can lengthen a shipment’s time table. Car transportation usually takes between three to seven days, while cross-country trips take between seven and ten days. That’s why we provide customers with a transportation quote from local companies to help cut down on travel time and cost. Every move is different please visit our estimated timeline page for more info. Should I choose an open or enclosed trailer? When picking between these two it’s all about determining how much exposure you’re willing to risk. Open trailers are the most common method and the least expensive. Enclosed trailers are the more expensive option because less cars are being shipped at a time. They’re used for expensive vehicles, especially ones with expensive paint jobs. Closed trailers are also used for vehicles that don’t meet the measurement requirements of the standard open container haulers. Both are safe when transported correctly. How much does auto transport cost? There are many factors that go into price for auto transport. If you know you need to ship a vehicle its best to fill out a quote form. If your like many and just want to get an idea of cost try our “free estimate auto shipping rates” page. Every transport company has a different method when dealing with customers who want to save money by adding items to the vehicle they are shipping. 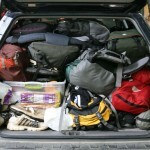 Our page “Can we put stuff in the car” should help with some of your concerns. We hope you find answers to all your other concerns on our Q&A page. Please use all the information available to make the best choice in a shipper.